In recent posts I have discussed the smallest and largest of the woodpeckers in the region, as well as focused a spotlight on the oddball yellow-bellied sapsucker and the medium-sized Northern flicker. This week’s post will focus on one of the most common, although ridiculously misnamed, woodpeckers, as well as one of its rather uncommon relatives. Photo by Ken Thomas Just as acrobatic as its relatives, the red-bellied woodpecker ranks as a popular visitor to feeders. This photograph shows off the splash of red on the belly that gives this particular woodpecker its name. 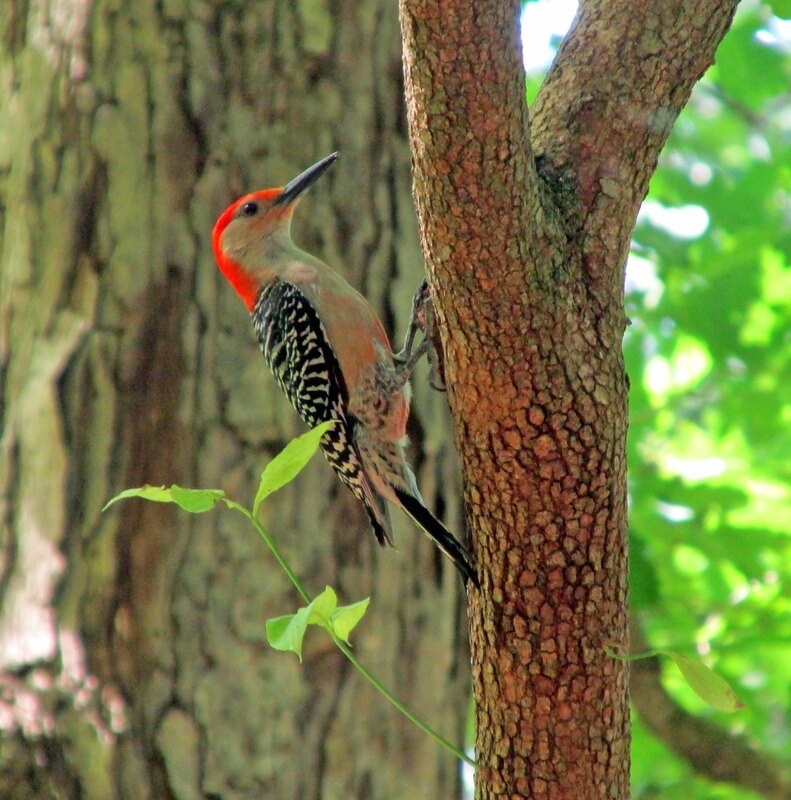 Among the woodpecker family, the red-bellied and red-headed woodpeckers are close cousins, belonging to a genus of those tree-clinging birds known as Melanerpes. The term, translated from Latin, means “black creeper.” Indeed, many of the two dozen members of the Melanerpes genus have an extensive amount of black feathers in their plumage. Other members of the genus include woodpeckers from the Caribbean, as well as from Central and South American. Some of them have quite colorful names, such as yellow-tufted woodpecker, golden-cheeked woodpecker and the accurately named beautiful woodpecker, a native of Colombia. Photo by Bryan Stevens When climbing the trunks of trees, red-bellied woodpeckers don’t often reveal the faint reddish wash on the feathers covering their stomachs. This photo, however, is an exception and shows the trait that gives this medium-sized woodpecker its common name. It’s also named for a characteristic of its appearance that is not particularly prominent and not easy to observe. The faint tint of red that tinges the white belly feathers is extremely difficult to observe when this woodpecker is hitching up the trunk of a large tree. Because males, and females to a certain extent, have a red cap, the species has been erroneously referred to as a “red-headed woodpecker” by many casual observers. The true red-headed woodpecker, however, has an entirely red head and a plumage pattern that, considering its color trio of red, white and blue-black, is downright patriotic. The red-headed woodpecker (Melanerpes erythrocephalus) is about the same size as the red-bellied woodpecker. Photo by Dave Menke/U.S. Fish and Wildlife Service The uncommon red-headed woodpecker deserves its common name because it, and not the related red-bellied woodpecker, has an entirely red head. All woodpeckers are noisy when the mood strikes them, but the red-headed and red-bellied have always struck me as rather more clamorous than some of their relatives. The most common call of the red-bellied woodpecker is a sort of rolling “churr” repeated frequently while the bird is on the move from tree to tree. To enjoy close views of the red-bellied woodpecker, provide plenty of peanuts, sunflower seeds and suet cakes. If there are any of them in the woods nearby, they will find these food offerings in short order. All my research indicates the same is true of red-headed woodpeckers, but I’ve never observed this woodpecker at my home. 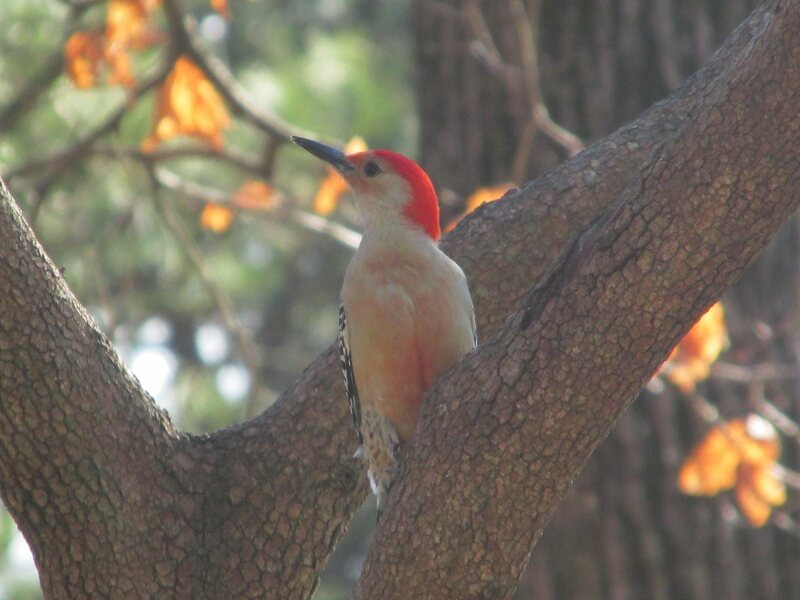 I’ve seen red-headed woodpeckers in Tennessee, Virginia and South Carolina, but their populations are somewhat localized. Woodlands dominated by oak trees are often inhabited by both these woodpeckers, which are fond of the acorns produced by these trees. Photo by Bryan Stevens A female red-bellied woodpecker peers around a tree trunk. One reason the red-headed woodpecker may be less common than its cousin relates to its fondness for hawking for flying insects along roadsides. The woodpeckers are frequently struck by cars when swooping after their winged prey. Historically, the American chestnut and beech trees also provided much of the mast crops consumed by these birds. 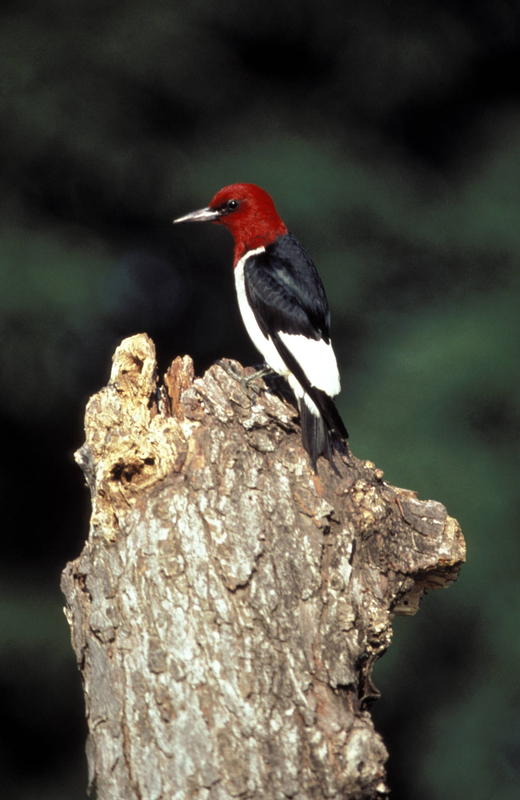 With the extermination of the chestnut and the scarcity of beech in some locations, the red-headed woodpecker now depends on oaks and acorns. In fact, this woodpecker is rarely encountered outside of woodlands with an abundance of oak trees. 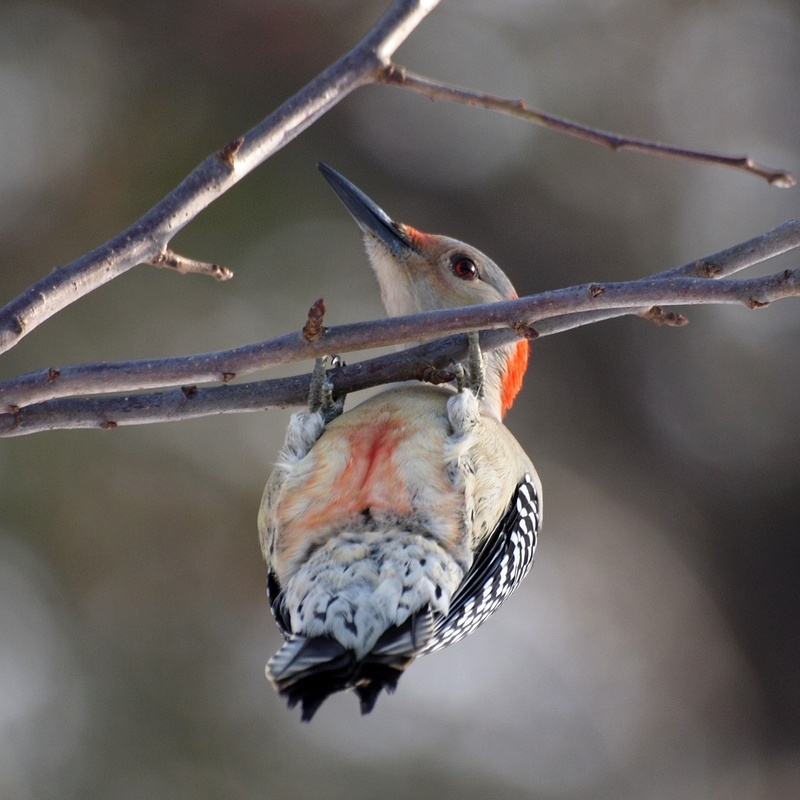 At feeders, red-bellied woodpeckers are prickly customers that often refuse to play nice with other birds. I’ve seen them stare down other large feeder birds, including blue jays, mourning doves and evening grosbeaks. 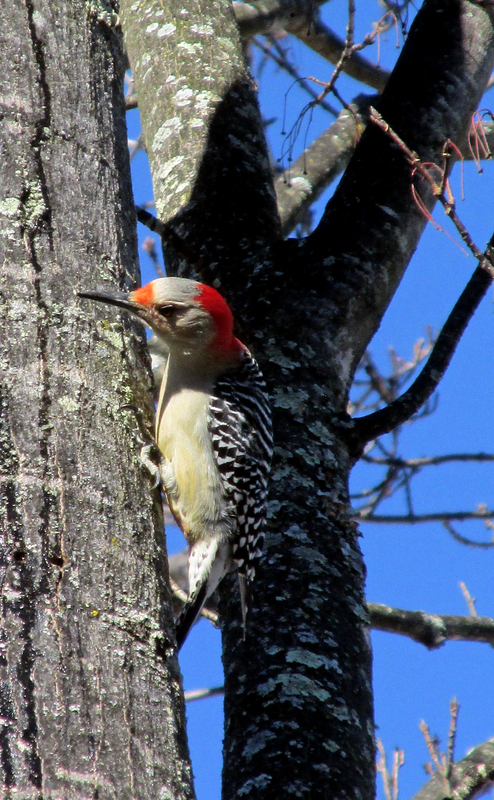 With its large bill, the red-bellied woodpecker commands some respect. Photo by Bryan Stevens Although once considered a bird of the southeastern United States, the red-bellied woodpecker has expanded its range north and west during the past century. Anyone who has hosted these birds knows they are a welcome visitor to any yard. Who knows? Some day I may even get a visit from the elusive red-headed woodpecker, which is the only woodpecker resident in the region to thus far avoid my yard. 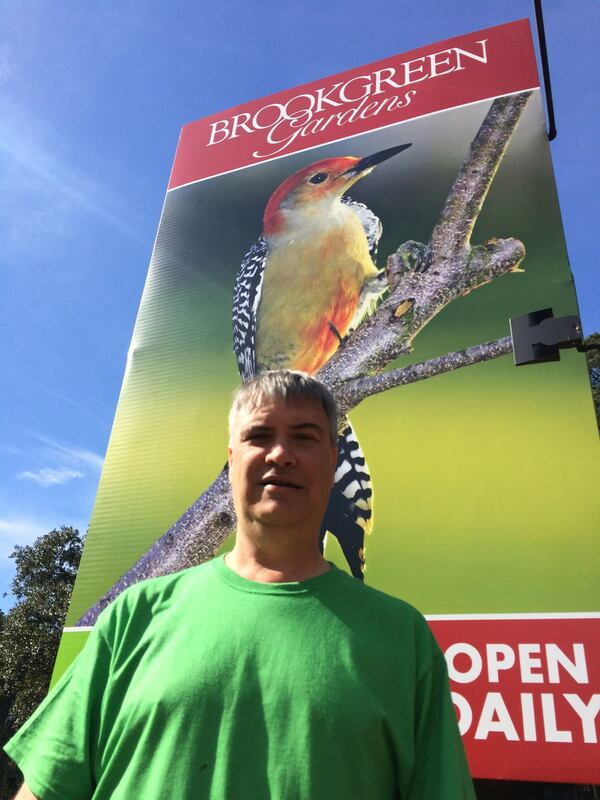 Photo by Mark Stevens A promotional sign for Brookgreen Gardens in South Carolina bears the image of a red-bellied woodpecker. To learn more about birds and other topics from the natural world, friend Stevens on Facebook at https://www.facebook.com/ahoodedwarbler. He is always posting about local birds, wildlife, flowers, insects and much more. If you have a question, wish to make a comment or share a sighting, email him at ahoodedwarbler@aol.com. This entry was posted in Birding, Birds, Bryan Stevens Feathered Friends, Carter County Compass, Elizabethton Star, Erwin Record, Melanerpes, Our Fine Feathered Friends, red-bellied woodpeckers, red-headed woodpeckers, Woodpeckers and tagged Birding, birds, Bristol Herald Courier, Bryan Stevens, Carter County Compass, Elizabethton Star, Erwin Record, Feathered Friends, McDowell News, Our Fine Feathered Friends, red-bellied woodpecker, red-headed woodpecker, The Erwin Record, Woodpeckers on March 6, 2016 by Bryan Stevens.